With a new year set to begin, Rafael Carbajal is ready for his next challenge. The 56-year-old is one of the most experienced soccer minds in the country, having first gotten involved with the Canadian game in the late 1970s after moving here from his native Uruguay. He began 2016 as an assistant head coach of the Canadian men’s national team. But partway through the year, he received a tantalizing offer from Fernando Aldao, chairman of Canadian SC in Uruguay’s Segunda Division. With the Uruguayan league radically altering its format in 2017, Canadian SC (based in Montevideo) was in need of a manager for its shortened season at the end of 2016. For Carbajal, it was a chance to return to the city where he’d grown up and once signed as a youth player for Defensor Sporting. It was a chance that he couldn’t afford to miss. It was an eye-opening experience for Carbajal, who had spent nearly a decade involved with Canada’s national teams. But the decision to test himself in Uruguay fits right in with the mind set that’s guided him through his whole career. He began coaching in Canada in 1990, working at the youth level for seven years before taking his first senior position with the North York Astros in what was then known as the Canadian Professional Soccer League. After four years working domestically, during which he acquired his Canadian “B” coaching license, Carbajal wanted to expand his horizons, and took a coaching position in Italy— which turned out to be a “totally different experience” than working in Canada. “I realized that if I wanted to grow as a coach, I needed to be in a soccer country,” he said. Over the course of five years, he worked for three different Italian clubs and successfully acquired his UEFA “B” coaching license. But in 2006, a family situation pulled him back to Canada for what he thought would only be a few months. As it turned out, however, he’d remain in Canada for another decade, quietly becoming one of the country’s most important builders in the sport. He first joined the national-team setup with the women’s national team under Carolina Morace, who managed Canada from 2009 to 2011. He then worked on the men’s side—with Canada’s U-18, U-20 and U-23 Olympic teams—for several years, until he got the call in 2014, from then-head coach Benito Floro, to join the staff of the senior national team. “I learned so much from the guy, it’s unbelievable,” Carbajal said of Floro, the Spaniard whose own 40-year career has taken him around the world, including Real Madrid. 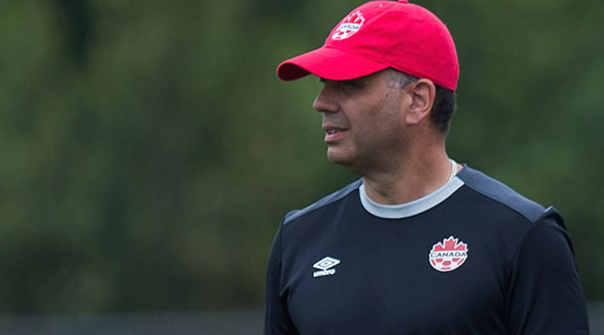 During those years, Carbajal not only acquired his USSF “A” coaching license, he was also working behind the scenes to help grow the Canadian game at the grassroots level. He was one of the key instigators behind the creation of League1 Ontario, a semi-professional league founded in 2013 with the goal of bridging the gap between community youth clubs and the professional ranks. “Without League1, our young players were not having the opportunities that they needed,” said Carbajal. Lacking an entrenched culture of professionalism, Canada has for decades been failing to produce players with the technical quality and tactical discipline to compete at the highest levels. It was a disparity that Carbajal saw firsthand during his recent experience in Uruguay. “[In North America], players make a lot of mistakes and they get away with it,” he said. “[In South America], you make a mistake and you pay for it, and you pay dearly—it costs you the game and could cost the player his position on the team. The shortcomings of the Canadian game aren’t entirely the players’ fault, of course; without proper guidance and structure, players can only be expected to do so much. It’s why Carbajal got involved with starting League1 Ontario, and why he’s looking forward to the upcoming launch of a new, national professional league (something Canada hasn’t had since 1992). His advice to fellow Canadian coaches? Get out of Canada, at least for a little bit. It’s easier said than done, of course; Carbajal is one of the few Canadian coaches to find opportunities in the soccer hotbeds of South America and Europe. That experience would make him one of the most highly prized managers in the new Canadian professional league, which is set to launch in the next few years. But he’s not ready to settle back down in Canada just yet. With his tenure at Canadian SC finished (on very good terms), he is ready for an even bigger and bolder challenge ahead. “I’m looking forward to working outside of Canada again, where I can continue growing my career and gain more experience,” he said. That doesn’t mean that the door is closed on a return to Canada at some point. But before that can happen, Carbajal feels the need to push himself in another hyper-competitive environment abroad. All that’s left to determine is where the next step on the journey will be. “I really hope that one day I can see Canada with a professional league where everybody wants to come to coach or play here,” he said. “I love Canada and I would love to come back and stay here and coach here.